We all know how important brand consistency is in order to keep an audience engaged, and here at Juno Web Design we’re committed to helping you achieve that level of consistency across your multi-channel environments. With social networking becoming increasingly important we work hard to ensure a brand’s design translates to the social sphere, and having recently worked with For Goodness Shakes we thought we’d show you how it can be done. 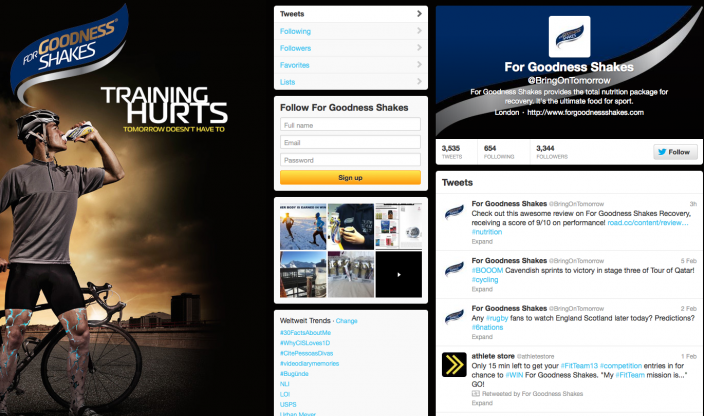 For Goodness Shakes (and Athlete Store, the official supplier of these products) offers sports recovery drinks and related products to help maximise performance both during training and in recovery, and their no-nonsense approach to fitness is matched by a high-impact web design that instantly captures attention. Everything about the brand is built to engage an audience and we wanted to ensure those recognisable traits were correlated in the social arena too, and with specially-designed Twitter backgrounds and Facebook holders we’re proud of the results achieved. The design of both For Goodness Shakes and Athlete Store have been carefully aligned to ensure consistency, meaning fans will instantly know the association between the two, and with reciprocation between the pages it works on a wider marketing level as well. It’s all about keeping fans informed and engaged, and it’s clear to see how this level of consistency will have an impact—there’ll be no confusion between sites or between pages, and that kind of association can easily deliver measurable results to the brand as a whole. Want to have that same kind of result? Then get in touch. We work hard to ensure consistency across a brand’s multi-channel environments and For Goodness Shakes is just the latest company to benefit from our expertise, so if you like what you see just call us and your social channel could soon have the impact it needs.